My car is dying and I need a new one. So I've taken a very geeky approach to finding a new one. I checked my credit card statements for last year and I spent just under £1200. So about £100 a month. I've spent about £300 already this year. So it's costing me about £3,200 a year to run my car. Not including tax, which is relatively small compared to these 2 factors. The mission, then, is to find the cheapest car to run. I need the highest MPG and the longest warranty. After much surfing around here's my results so far. I'm not including any electric cars. My daily commute is about 30 miles, so the range in winter, up hill, with the heater and stereo on is not going cut it. Values are from manufacturer website only. They are guidelines really, you can probably haggle and part exchange, etc. Warranties have a huge amount of small print, none of which I've read. I'd imagine the warranty for each manufacturer is good and bad in completely different ways. Best Price: Kia Picanto, with trade in for my current car. 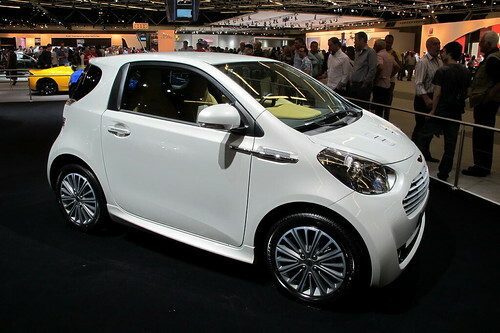 The one I like the best: Toyota iQ. I'll update this post with more info when I can.